a surviving queen to lay eggs that will produce the new spring foragers. 1. Enough bees. I've got 5 colonies. One is small, three are big, and one is too angry to let me look at it. The small colony is headed by Queen Nefertiti and they are a healthy, docile group of bees. They are small because they started off rather late in the season and were limited by scarce summer forage. I've supplied them with extra frames of stores (previously taken from the queenless colony mentioned here) but still their chance of survival is lessened by their low numbers. So I'm making plans to unite this colony with Queen Katherine's colony in the Pond Hive. 3. Enough food. As I mentioned before, the bees had a hard time finding nectar this summer. When on holiday last week, I worried that they might be starving and wondered if I should have left them some sugar syrup before I left. But when I got home, all was well. The bees were foraging strongly - they seem to have found good sources of nectar and pollen. Some were coming in with white-backed thoraxes, which is the tell-tale sign of himalayan balsam. That plant may be a nuisance in the waterways but at least it's giving the bees some late-season nectar. Anyway, for the beekeeper's purposes it would be most convenient if the bees could fill and cap each super full of honey by the end of summer, ready for removal and extraction. In practice, the supers are part filled with nectar and are not ready for extraction (too watery - the honey is not ready yet), not suitable to be taken off and stored (the unripe honey will ferment and/or go mouldy, supers will be invaded by mice/wax moth etc), nor to be left on the hive (risk of tainting by thymol treatment, and anyway I want to clean up the boxes and frames). Supposedly, if you move the supers to a higher position above the crown-board of the hive (within the roof space), the bees will transfer the stores from the super down in to the main body of the hive - the brood box. That's where I want the stores to be, as that is where the bees will cluster over winter. So, I'm trying this. Next week I hope to be able to remove empty supers from the hives and put them into storage, leaving the bees with their brood boxes nicely full of stores. Well, we'll see. 4. A surviving queen. For this one, I cross my fingers and hope all will be well. With one exception: Queen Irate, mother of the angriest bees I've ever met. 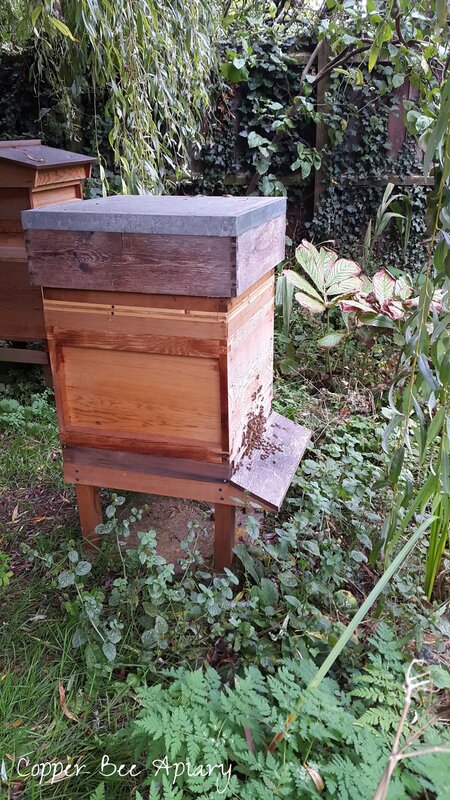 Update, October 2017: elevating the supers to a position above the crown board, with a gap between super and brood box, did not result in the bees emptying the stores out of the super. The ideal solution, I think, would be a chest freezer to store them in over winter. Failing that, freezer and house are currently filled with laboriously wrapped super frames which may or may not make it through to spring.